While shopping at Walmart a display similar to the one below deserved a second look. 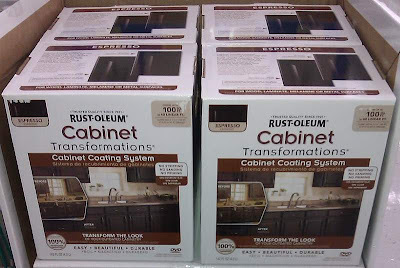 It appears that the Walmart in Loveland is discontinuing the 40 linear feet "Dark" Rustoleum Cabinet Transformation kits. Original price for these kits at Walmart is about $74 and is on clearance for only $40! Most online retailers have the kit priced around $150. So this is the most aggressive price we have ever seen for this product. Clearance Priced for $40 at Walmart! The Location of the Walmart for this deal is 1325 Denver Ave, Loveland, CO. But the location of the store probably doesn't have much of a difference since most of the items are the same regardless of geographic location. Happy hunting!